Rolling footage of the new MINI. 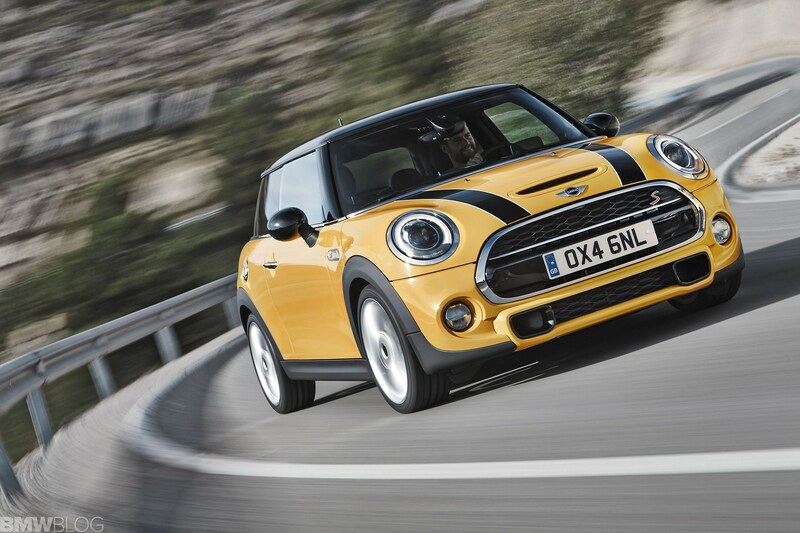 At a first glance one might say that the new MINI looks just like the old one, but a closer look reveals a new car with an unique identity but the same pedigree. The F56 length was increased by 98 millimeters, width by 44 millimeters, height by 7 millimeters, also has a longer wheelbase (+ 28 millimeters) and larger track width (front + 42 millimeters, rear + 34 millimeters) as compared to the predecessor model (differential figures relate to MINI Cooper). The luggage compartment volume was increased by 51 liters to 211 liters. The new MINI retains the large round headlights but gets a hexagonal radiator grille which dominates the front with its larger size. At the rear, the taillights are surrounded by a thick chrome border and wrap around the car and onto the trunk. From the side, the R56 looks less imposing, mostly due to the beefed up look of the F56 and larger dimension. There are three model variants available at market launch: MINI Cooper with 100 kW/136 bhp 3-cylinder engine, MINI Cooper S with 141 kW/192 bhp 4-cylinder petrol engine and MINI Cooper D with 3-cylinder diesel engine (85 kW/116 bhp).